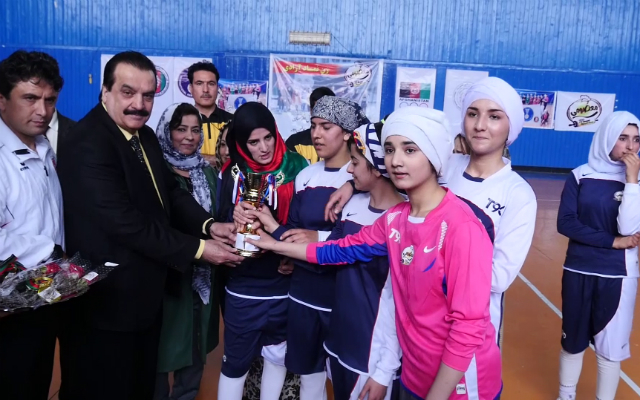 A women’s handball team won the friendly match held to mark International Women’s Day in Kabul on Thursday. Two teams, Kabul A and Kabul B handball teams attended the event at Kabul sports gymnasium. Kabul A won the match. “We have an upcoming match in India. It is for the under-18 team. We hope we will get good results from it and our federation is very happy with our performance,” said Aisha Bahar Bromand, an organizer of the event. “The goal of this event is to motivate women to play handball and become familiar with the way the sport is played,” said Bahara, one handball player. “Winning or losing was not important for us. We could bring smiles to the faces of women here, and that is our victory,” said Humaira, an athlete. The handball competition has been an annual event for the past three years to mark International Women’s Day. The event was held to mark International Women’s Day and to promote handball among women and girls.